Until Microsoft(s msft) releases a touch-optimized version of Office for iPad(s aapl), the next best solution might be the new Remote Desktop app for iOS. Microsoft released the free software on Thursday for iOS and Android(s goog), allowing users to remotely connect and control a Windows PC from a phone or tablet. There are a number of uses for such a product but the first one that came to my mind was using Office on an iPad via the Remote Desktop client. Microsoft is working on a version of Office for Apple’s tablet but there’s no release date information yet available. The new software could also find a home in enterprises that have adopted iOS and Android devices to supplement existing PCs. While there have been numerous similar solutions from third parties, it’s nice to see Microsoft starting to support other platforms with this effort. Why it took so long, I don’t know. It’s almost as if by delivering a Remote Desktop app for iOS and Android, Microsoft is finally admitting these two platforms are becoming more relevant by the day. Would native Office apps for non-Windows devices be more welcome? Sure, but at least this gives a taste of what’s yet to come. And the Metro-style apps for Windows 8 are already touch optimized, so using them remotely on a tablet is an added bonus. This would be useful on one of those Android TV sticks. You could use your computer from the living room. Attach a wireless (USB or Bluetooth) keyboard to the stick, and use it like you normally would. I tried it on a HP TouchPad with Jellybean, and it ran decently enough to allow control of the desktop. I tried Jetpack Joyride, and it ran at something like 5-10 frames per second. 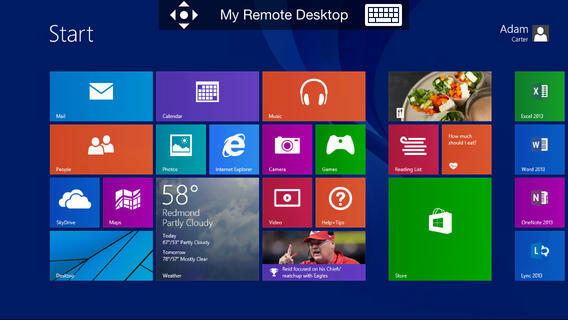 Check out my illustrated tutorial for the Microsoft Remote Desktop Client for Android on a Tronsmart MK809 MiniPC at http://android-minipc.azurewebsites.net/index.php/2013/10/using-microsofts-remote-desktop-app-with-a-tronsmart-mk908-minipc/. have you enabled remote desktop connections on the machine you’re connecting to? Also make sure your user account you are using to connect has permissions on the machine to log on remotely (if you’re using an admin account this should be automatic). It takes a bit of setting up but it works well enough. Accessed my Windows 7 laptop from the iPad and the Tesco Hudl. On the whole I prefer Splashtop. I have windows 8 and can’t figure out how to set it up. Help me out? Does this work with Windows 7? Neither the article nor the Play page says. I’ll give it a try because my old remote software quit working with Windows Media Center after an update (Microsoft update??). Hmm, so do I need my own domain to use this? Awww. This is kind of like back when flying in an airplane meant you had an excuse to not answer email or work. Now there’s no excuse not to work even when you’re relaxing with your iPad. I believe you meant now? Otherwise, thanks for the information!